It is a record year for IPOs but for how long can the party last? Lunch hour these days is rush hour on Dalal Street. Ever since the benchmark 30-share index, the Sensex, pierced the 20,000 barrier - 32 months after it first touched that mark - people of all hues are gravitating toward the hallowed building that is home to the Bombay Stock Exchange, or BSE. Some are attracted by the sheer hysteria and choose to gaze fixedly at stock prices flashing outside Phiroze Jee Jee Bhoy Towers. The braver ones want a piece of the frenzied action and encircle the hawkers who are busy doling out forms of initial public offerings, or IPOs - issues of shares - to the public, most of whom are now convinced they can get richer quicker. The herd is back on The Street. "We are back in business," says a visibly happy vendor as he digs into a stack of IPO forms. "It is unbelievable, but true: the boom is back," beams Umesh Pandey, a 31-year-old mid-level executive with a private bank. In early December 2007, Pandey had opened a dematerialised, or demat, account - which is like a bank account but holds shares instead of money - when the Rs 11,500-crore IPO of Anil Ambani-promoted Reliance Power was around the corner. Just five days before the Reliance Power issue opened for subscription the Sensex touched its all-time high of 21,206. Pandey would prefer not to remember what happened next. The Reliance Power share price is still below the issue price, and nine months after that issue the Sensex tumbled to 8,000 levels. "It was a steep crash," says Pandey with a frown. That experience has not deterred Pandey from participating in the IPO party this time around. 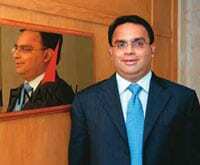 He had put in applications for shares in IPOs like Engineers India and SKS Microfinance. And he has had plenty to choose from. According to Prime Database, a firm that tracks primary markets offerings, until September, 56 companies had mopped up close to Rs 40,000 crore via IPOs and follow-on public offerings, or FPOs (see Primarily Making Merry). That's not far from Rs 45,000-odd crore raised in 2007 - the highest in any year in the history of Indian capital markets. By the time 2010 ends, however, that record will most surely be erased. Coal India's Rs 15,000 crore IPO coupled with some 40 offerings that have been cleared by market regulator SEBI and are expected to hit the markets in the next two months, will take the 2010 closing figure for IPOs to roughly Rs 50,000 crore. So what explains the onset of the silly season in the primary markets? Three factors: the first is liquidity, with foreign institutional investors pumping $23.5 billion into Indian equities in 2010 - and still looking for investment candidates in one of the world's fastest-growing markets. The second is the 20,000 peak scaled by the Sensex, which may be as high as the markets can go in this bull run. The third reason stems from the second. As Atul Mehra, MD & Co-CEO, Investment Banking, JM Financial, puts it: "Promoters are in a hurry to IPO because they do not want to be left out (from the boom)." Yet another shot in the arm for the primary markets is the government's disinvestment of a 10 per cent stake in Coal India, the largest ever IPO in India. And that also explains why there was a rush of public issues before the big one came. "Smaller issuers would prefer to stay out of the ring when a mega-issue is in play," explains Dilip Kadambi, Head of Equity Capital Markets (India) at Royal Bank of Scotland. In a similar vein, D.R. Dogra, MD & CEO at credit rating agency CARE, points out: "When a mega-IPO hits the market, investor appetite for smaller IPOs reduces." Making an IPO when markets are at near-peak levels has its advantages, but there have been issuers whose thunder has been stolen by Coal India. Consider, for instance, the Hyderabad-based BS Transcomm which debuted with a Rs 200 crore IPO on October 6. Days before the issue opened, Managing Director Rakesh Agarwal declared: "Timing has worked in our favour." It actually didn't quite work out that way. BS Transcomm, which had initially set a price band of Rs 257-266 per share, was forced to lower it to Rs 248-257, as well as extend the issue by three days. That the issue was subscribed only 60 per cent on the erstwhile last day is believed to be the reason for the price revision. Investors seemed to be holding on to their purse strings in anticipation of the Coal India blockbuster. The good news, however, is that the exuberance at near-peak levels is not totally irrational. Which means that fly-by-night promoters have not descended in a bid to make hay whilst the sun still shines on The Street. "We are far away from that kind of frenzy where anything sells," says Prithvi Haldea, Chairman and Managing Director, Prime Database. "Money is chasing good opportunities and businesses," he adds. Another positive in this boom is that pricing of issues has not been fanciful - unlike in the past. A CARE Research study of 116 IPOs between August 2007 and August 2010, in end-September, reveals that roughly three-fourths of the IPOs considered in 2007 are currently quoting below the IPO price band, indicating overpric-ing. In the current IPO rally, a little under 35 per cent of the issues considered for the study are quoting below issue price. Yet, many of these IPOs would have benefited from the overall buoyancy in Indian equities - and one could argue that the primary market is riding on the overvaluation of the secondary market. After all, almost every recent IPO has been valued at the Sensex price-earnings ratio (P/E), of 19-20. Recently, SEBI Chairman C.B. Bhave voiced his concern over the unrealistic pricing of IPOs. The regulator directed investment bankers not to overlook the interests of investors just to maximise returns for promoters as it is the former who get burned when overpriced shares fall when markets turn. Investment bankers counter that pricing is a subjective issue and depends on market conditions. "The right price is what the buyer is willing to pay," says JM Financial's Mehra. In a bad market, people look at value and in a good market they look at price, he explains. "There is nothing called perfect valuation," says Haldea of Prime Database. Yet, promoters in sectors that have been both culprits and victims of overpricing - like property - would do well to go easy. "We will have to be realistic in pricing our issue," says Jitendra Virani, Chairman and MD of Embassy Property Developments, a Bangalore-based real estate company that is set to tap the IPO market. If there is one disappointment with the current IPO boom, it is the minimal presence of the retail Joe. According to a study by New Delhi based SMC Capital, oversubscription at the retail level has been 1.61 times for IPOs in 2010 - as against 7.98 times three years ago. Yet Jagannadham Thunuguntla, Head of Equities at SMC Capital, reckons: "A selective comeback of retail investors is visible." That may also be a sign of danger, because retail investors tend to join the party when it is at its fag end. How long the IPO party continues is clearly a function of liquidity which, in turn, is a function of capital inflows. S. Ramesh, Chief Operating Officer, Kotak Inve s t m e n t Banking, feels that the disinvestment candidates are lined up to garner Rs 40,000 crore in the current fiscal year and that "will keep the primary markets busy for the next three to four months". Analysts reckon that if the secondary markets correct, they will do so more because of fundamental tremors in global markets - which may prompt investors to cut back their allocations to emerging markets - than money leaving the secondary market and finding its way into IPOs. And, as Kadambi of RBS says: "If the correction is steep - say 10 per cent - then the momentum in the primary markets will break." For now, few are leaving things to chance. Not Coal India, for sure. When the IPO was announced last fortnight, six investment bankers, four bureaucrats, two senior office bearers of Coal India and the Minister of State for Coal paraded in front of an enthusiastic media. Kalpana Mittal Baruah, Joint Secretary in the Department of Disinvestment, insists "this is not hard selling". Coal India may have done its homework, but many other wannabe issuers in the private sector will be praying that the Sensex does not run out of fuel in the days ahead.